The Furniture Scheme is looking for new volunteers who are interested in working with books and literature. We run the bustling Charity Bookshop in Craven Arms, and the book shop nestled in the back of Renaissance in Ludlow. We are grateful for any help that can be provided and can happily pay travel and parking fees should they be necessary and volunteers can do as little as one morning or afternoon a week. Please contact our volunteer support officer Di Hyde via email at diane@furniturescheme.co.uk or give us a call at Renaissance on 01584877751. Volunteers at our Warehouse urgently needed. 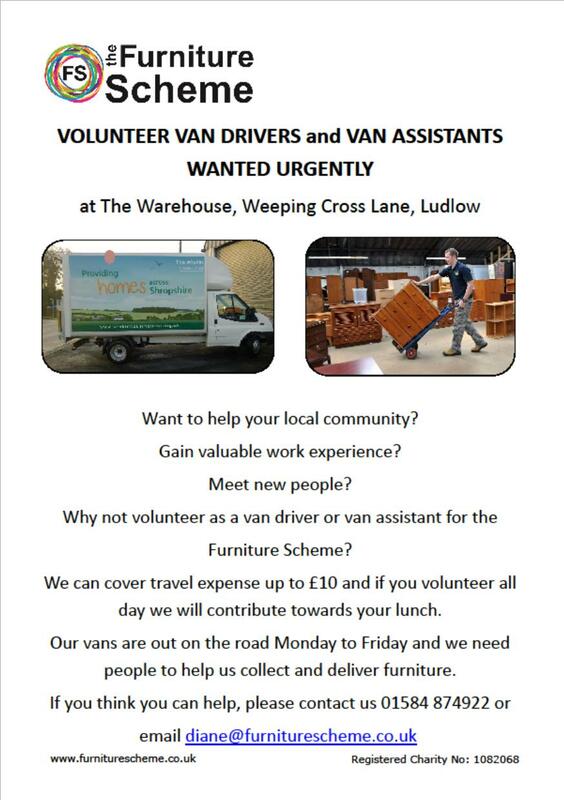 If anyone has a few hours to spare and would like to give something back to the community The Furniture Scheme urgently need volunteers at our Warehouse, Weeping Cross Lane, Ludlow. So if you’re strong and fit and able to move furniture and assist van drivers you would be most welcome!! We urgently need volunteer Van Drivers to drive our collection and delivery van. You will need to be physically fit and able to lift items of furniture. The hours are 8.30am – 4pm, (this can be flexible) we would especially like people on a Tuesday, Wednesday or Friday. We pay travel expenses and if volunteering all day we provide a lunch allowance. We need Customer Service volunteers at the Reuse Centre. We are flexible with time as you are being generous with yours, but ideally 8.30am – 4.30pm. Help is given with travel expenses. Could you help us to dismantle sofas, washing machines and other items ready for the recycling process? Times to suit you, but you will need to be reasonably fit as it’s quite hard work! Volunteers carry out a variety of tasks from stripping and polishing donated furniture to more challenging projects. Morning or afternoon sessions available, starting with a half day tester. You will be provided with full workshop training, support and the opportunity to gain a qualification. We would like volunteers to assist with the function testing of the electrical appliances at our Reuse Centre. You would work alongside a trained member of staff for this role – times to suit you. We sometimes have volunteer vacancies for a catering assistant to help our volunteer caterer at Rockspring Community Centre to help prepare lunch for our Thursday drop in sessions. In the Renaissance Centre we need help with answering telephone calls, dealing with enquiries, making sales, using the till and credit card machine, keeping displays looking attractive and using a computer. We are flexible with time as you are being generous with yours, but ideally either 9.30am – 1pm or 1pm – 5pm. We also need assistants in our Flea Market.